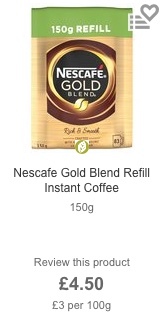 I like a cup of strong flavour instant coffee, I also like to recycle and encourage reduction in packaging. In a fit of packaging madness Jacobs Douwe Egberts lo'r has this most ridiculous plastic top on it's instant coffee. 6.5 cm plastic top -> 15% which overlaps jar by 3cm and has a further 3cm on top of that. This type of plastic top is typically non-recyclable ( unlike the glass ) and has no recycling marks identifying the plastic. There is also a plastic film wrapping the glass, which may look nice but does nothing for the recycling process. Is there a more effective packaging solution ? Yes but the economics don't look great on the latest Morrisons shopping trip. 66p more expensive for packaging free refill option. Sigh. Even worse for the environmentally minded Morrisons on-line shopping currently has the refill pack 50p / 100g more expensive than the glass jar version. 6 Nov 2017. Further advice on Recycling Etiquette. Thank you for contacting L’Or. The lid is made of plastic and is recycled through standard plastic recycling bins. I can't stand brewed coffee! It always smells so good and tastes so bad! My favorite is nescafe in a cup of hot milk with 2 spoons of sugar! It looks like you have different instants, too. I had a call back today from Morrison's head office after putting in a complaint via a web form. 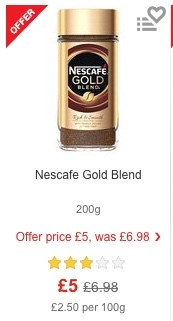 The caller agreed that having the same product (Nescafe Gold blend) more expensive in a jar compared with the refill packaging was indeed madness. The stated reason was that the jar version was on special offer. I reiterated that products in refill packaging should be much cheaper than full package products. It helps everyone to be green by not moving so many jars and plastic tops around the country when really all we need is the instant coffee in a plastic bag. Technical Problem to solve - "Blockfinder".